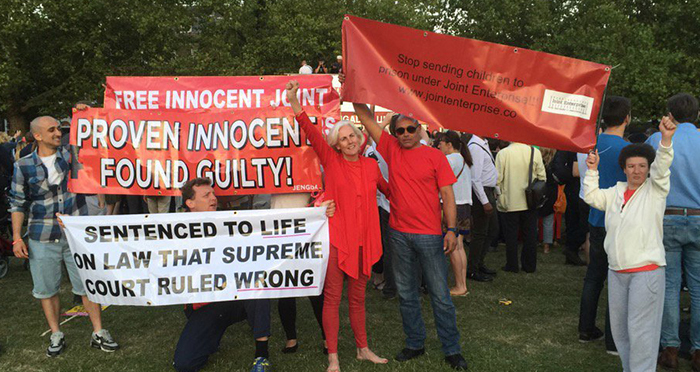 A man who studied for a law degree while behind bars for murder has had his conviction quashed after the Supreme Court’s hugely important R v Jogee ruling on joint enterprise. The joint enterprise doctrine states participants in a joint criminal enterprise will be criminally liable for the harm that results from that enterprise. The law in this area was overhauled by the Supreme Court in 2016, when it ruled the mental element of the doctrine was too heavily weighted against defendants. Ameen Jogee, who was serving life in prison for the murder of a policeman, was at retrial found not guilty of murder but guilty of manslaughter, and sentenced to 12 years. The Supreme Court’s Jogee ruling hasn’t just benefited its namesake, nor just changed students’ criminal law syllabuses — it’s now led to the release of a man, John Crilly, from prison. Crilly was given a life sentence following the death of a 71-year-old man, who was punched in the face by Crilly’s co-defendant, David Flynn, during a robbery. Crilly spent many of his years in jail studying for a law degree; he even wrote to the judge, Lord Leveson, to ask for the conviction to be overturned. Now, 13 years into his sentence for murder, that’s what has happened. In place of a murder conviction, Crilly pleaded guilty to manslaughter. This was on the advice of his lawyers: solicitor Simon Natas and Doughty Street Chambers‘ Timothy Moloney QC. Crilly was sentenced to 18 years for this lesser charge. But because he had served half of this time already, plus four more years for the break-in, he has been released. Also on JENGbA’s agenda is the case of Laura Mitchell, who was involved in a group fight outside a Bradford pub in January 2007. She claims, however, that things had died down and that she was simply looking for her high-heels which she’d lost during the brawl when Andrew Ayres was murdered by two of her co-defendants. She is currently behind bars for Ayres’ murder. The Criminal Cases Review Commission has now referred Mitchell’s case to the Court of Appeal. She will be represented by the same legal team as Crilly was. This may be legally correct, but most of those convicted are morally reprehensible individuals who should have been charged with related offences and now stand to go Scot-free. Ok. Everyone aged 11 and above understands. Give the jury legal advice after the defendant has argued with the witnesses and cid about the facts. Tick. The judge does this. Free the lawyers up to do something else. Save the taxpayer a fortune, or redirect the tax payment to another social task. Cut short what I wanted to say. Yeah, it is a simple concept. Quite a lot of the law is simple when it is distilled to concise statements of principle. In a trial the prosecution will lead evidence to show that it was murder and not manslaughter. The defence’s job is to show that it wasn’t or put some doubt into the minds of the jury that it was. Simply giving the job over to the judge wouldn’t suffice. That’s not his or her function. I agree entirely. Trials don’t take longer when defendants are unrepresented. Even if they did, this doesn’t cost more than the paltry amount that criminal barristers earn. The law is really, really easy. Defendants are more than capable of making the legal and evidential submissions that arise in trials all to often. it would also be more fair for the prosecution to instruct a team of lawyers and a barrister whilst the person facing a life sentence gets no one. People on Judge Rinder manage it, why not criminal defendants, right? And as for GPs, I just google my symptoms and pop down to Boots every now and again. Let’s get rid of them too etc. etc. I don’t think it helps to pray in aid GPs. 10 minutes then a med or antibiotic. I did not suggest that the crown should have lawyers. I mentioned cid, the witnesses and the judge and jury having a role. A case everyone is familiar with is Adam Johnson of Liverpool F C having sexual relations with an underage fan…why did the police and him need a QC each for that ? He either kissed her in the car, touched her private part , did one or the other or he just gave her a t shirt in the car. Everyone over 11 knows what Range Rover back seat looks like and they know the difference between completely lying, kissing or touching privates yet the Treasury fund a matching male and female Q C . Both of which show off. I also mentioned freeing the lawyers and the taxpayers money up for something else, so you would still get public funding , only for something more worthy than funding your client’s desperation. Give us your thoughts on Adam Johnson please. What roles? Who is going to prosecute? How will the evidence come out? Are you suggesting a reformation of the entire adversarial system? Will this save time and money or result in longer trials? What roles do you envisage? Can you say that this will be a saving? How do you know if a client is desperate without prejudging the issue? Do you agree that some defendants are innocent? If there are categories, how do we distinguish between the two without evaluating the evidence? Isn’t that what happens in criminal trials at the moment? Did Adam Johnson get legal aid or did he pay privately? Did Adam Johnson ever play for Liverpool (rather than Man City, Sunderland and Middlesbrough)? How do you define showing off? Were you at the trial? Don’t most trials (criminal or civil) boil down to did x do y? What do you deem worthy of public funding? Yes, I am proposing a revolution of criminal justice. Some details are below. I know from experience that desperation plays a large part in the lives of the poor and the disenfranchised working class. It feeds crime, mental illness and particular habits of consumption. It feeds lawyers etc, psychiatrists etc entrepreneurs, private and pension equity etc. You may need 10 to 20 people in a court process to decide a case like Adam Johnson’s , plus a judge and jury, over a period of months. If I was a judge, I could manage with the two witnesses in hours. We can build from two and hours , if trial and error warrants it. I am against you on most of your points. E.g. most defendants are guilty. The barrier to crime is so low. The number not caught is high. Those caught are usually guilty of a crime. The cps may over charge to feed their multitude, but they wouldn’t if I was in charge. The QCs postured for me. I don’t think it is contentious to accuse criminal silks of showing off. They are at the top of an unnecessary pyramid which, for example, probes what happened in the back of a range rover between a desperate teenager and a desperately bored footballer. Adam Johnson played for those clubs , yes. He scored against Liverpool in his final game. I confused that memory. County court civil cases are that simple, yes. Let’s reserve our position on all high court cases being simple. Even I would need more than two witnesses for some high court cases. I think public funding for skilled professional people to deep dive into the desperation I mentioned , with a view to reversing it, is worthy of tax payers ‘ money. This would have the benefit of making the life of the pauper or desperado much more fulfilling, and likewise the life of a clone of the secret barrister or an impoverished hack from the inner temple of less years call than he. It would put swathes of people out of a job, and sorting that out would be part of the deep dive. Oh no, comrade. I’m not an idiot by any manner of means. Get out of the new road, if you can’t lend your hand. Don’t block it for decent folk. Check out Bogart. Plod are dirty. I have no quarrel with the law surrounding joint enterprise, however I do think more needs to be done to understand it. There have been cases were it hasn’t been utilised when it could have and vice-versa. Perhaps the person or persons who provided Jack The Ripper with food, shelter, etc, was also culpable? DON’T THINK SO! Terrible thing that, wanting a group of violent people and their supporters and hangers on to each get punished to the full. Awful. Obviously when there are group attacks on victims and the police can’t show who carried out the fatal stabbing they should all go free, or just get a minor sentence for affray. Natch. If they were violent and his supporters then they would be guilty by joint enterprise. The problem with the law was that the rule was different for a murder case than in any other joint enterprise. In any case except murder the prosecution had to show a joint intent to commit the offence, but in murder they only had to show that a secondary party realised the principle might kill or do GBH. This lead to some very strange results. The killer would be found Not Guilty if the Jury were unsure that he intended to kill / do GBH as for the principle the prosecution had to prove intent. But in the case of others present, they only had to show that they foresaw the risk that he might kill / do GBH. It clearly was not right that the person striking the fatal blow would be aquitted on those with him convicted. Prosecution policy of charging everyone present with murder also tended to mean that witnesses would not admit to being present for fear of being charged with murder. I defended in a multi-handed murder last year where the first boy to be interviewed admitted being present and named the killer. He was charged with joint enterprise murder, along with friends of the victim who had remained at the scene, attempted first aid and called an ambulance. Witnesses who plainly were there on the rest of the evidence, claimed not to be, knowing what had happened to the first witness and the prosecution case nearly collapsed. The old law sent a clear message to witnesses. Don’t admit you were there and don’t tell the police what happened as if you do, you may find yourself charged with murder. This was not a good state of affairs. Can I ask about scenarios (which must be reasonably common) in which the police have no way of knowing which of a group was the killer – no material evidence, no witness evidence etc? What would have happened before, and where are we now, legally speaking? It depends. If 5 people all attack a victim and he dies as a result, then the prosecution does not have to prove which of the five people struck the fatal blow. This is not a joint enterprise case. All 5 are joint principles. If A attacks B and his friends are present but do not participate then whether or not his friends are guilty depends both on their intention and what they did. Doing nothing is not a crime. Failing to prevent a crime is also not a crime. However, the prosecution will argue that they encoraged him by their presence. If they did then they have the actus rea for murder. Under the old law all that it was then necessary to make them guilty of murder was for the friends to realise that the principle might intend to do really serious harm. They did not have to intend that B suffer really serious harm or even think it likely. This put the law on joint enterprise murder completly at odds with joint enterprise in all other offences. So if I give you a lift to the bank and you then pull an armed robbery, I am not guilty of armed robbery (but you are) as I didn’t know you were going to do that. For robbery joint enterprise I must share an intention with you that a robbery will be committed. It is not enough that I think to myself “well I suppose there is a chance you might commit an armed robbery as anybody might do anything, but I don’t think it is likley.” That state of mind was enough to convict me of murder under the old law, but not any other crime. The change brings the law relating to murder in line with all other offences. I must intend that the victim is killed or suffers really serious harm to be convicted now of murder. Under the old law, whilst the Prosecution had to prove the killer intended to kill, they only had to prove that the others thought there was a chance he might even if they did not intend the victim to be killed nor did they think it likely. In the case I gave as an example, the killer and deceased fell out and arranged a fist fight in a local park. They both invited their friends to watch the fight. All the kids turned up, sat on the ground and watched the two square up. After a couple of punches had been exchanged, one kid pulled a knife and stabbed the other through the heart. All of the kids present, where by their presence encouaging an unlawful fight. So had it stayed as fists all would be guilty both under the old law and new law of common assault by joint enterprise. The account of the other kids present was that they were their to watch a fist fight between schoolboys and did not think for a moment that anyone would pull a knife. That made them not guilty under both the old and new law. Under the old law however, if one of the kids watching the fight had thought to themselves “Well I know both those kids and I suppose one of them could have a knife, but I don’t really think that is likley” that would have been enough to make the spectator to the fight guilty of murder. Under the old law, if the jury accepted that the killer had only meant to cause a minor injury he would be Not Guilty and the spectators Guilty. The new law means that in the case of each spectator the prosecution would have to prove that he intended the victim to die or suffer really serious harm to make them guilty of murder. Under the old law, realising that there was a chance the victim might die or suffer serious harm was enough. Yes, it does. Thank you for taking the time to answer. It’s appreciated.